Iron Hub Winery is owned and operated by Tom and Beth Jones and their children. Tom was the founding winemaker of Lava Cap Winery in the Apple Hill area near Placerville, CA after completing his Master Degree (Viticulture & Enology) at University of California, Davis. He developed Lava Cap Winery’s style of award-winning wines for almost 30 years and left mid-2013 to begin new endeavors. Tom and Beth purchased their current 33 acre property in Amador County in 2014. The property had been known as Amador Foothill Winery and includes hillside vineyards in the beautiful Shenandoah Valley AVA of California. Tom was drawn to the property, stating” there is no substitution for controlling the growing conditions in the vineyard and, most importantly, tasting the ripening grapes to determine harvest”. He added, “Our new estate affords me creative control from the vine to the bottle”. The Iron Hub label was launched in 2016 and features handcrafted estate-bottled varietals and blends, including both white and red wines. 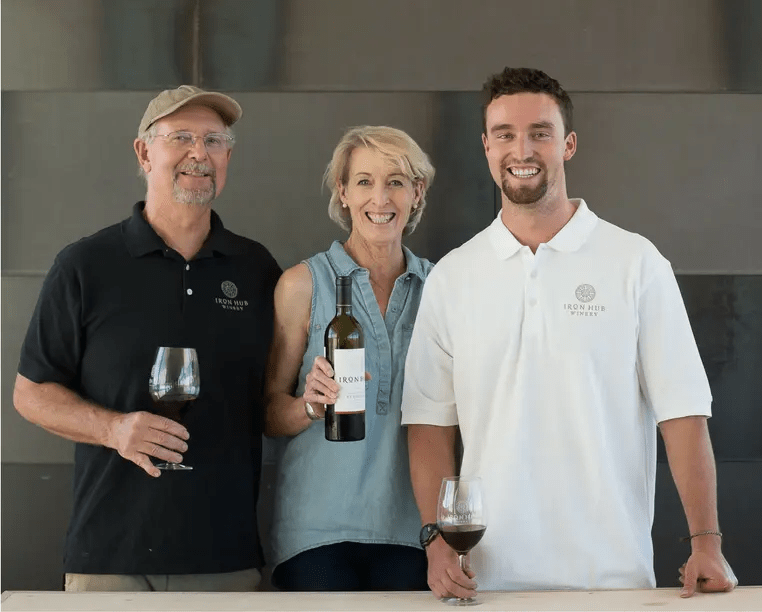 Son Spencer joined the winemaking endeavor in the summer of 2016 after graduating from University of Oregon (B.S. Geology). Tom states that “my interests lie in handcrafting elegantly balanced wines that reflect this beautiful terroir and are approachable and food friendly”. Through the Iron Hub label, Tom continues his tradition of creating lovely award-winning wines including Chardonnay, Zinfandel, Barbera, and red blends. Iron Hub’s name developed from winemaker Tom Jones’ annual tradition of taking a high mountain sojourn to rejuvenate after each grape harvest. On one recent adventure, Tom discovered an antique, hand-forged wagon wheel hub in the remote outback. The iron hub exemplifies the artistry and beauty of hand-forged tooling of days past. Tom and Beth named their new boutique winery on Steiner Road “Iron Hub” to reflect their joy of discovery and craftsmanship. Tom and Spencer employ a hands-on approach to every aspect of the wine making process, from tending the grapes in the estate vineyards to carefully crafting both red and white wines. The name Iron Hub also is a reflection of a welcoming place to gather. A new tasting room is opening in the fall 2017 and will be a special place to gather with family and friends to enjoy fine wine, great hospitality, and the beautiful Sierra views.